The Samsung SCX-4300 is a monochrome multifunction laser printer with additional scanning and copying capabilities and tons of convenience features all rolled into one compact package. This affordable small business and home office unit can take the place of multiple pieces of equipment, saving precious work space. Boasting reasonable print speeds, a user interface with an LCD screen, vast operating system compatibility and decent resolution, the Samsung SCX-4300 is a viable business solution that will secure a solid return of investment. 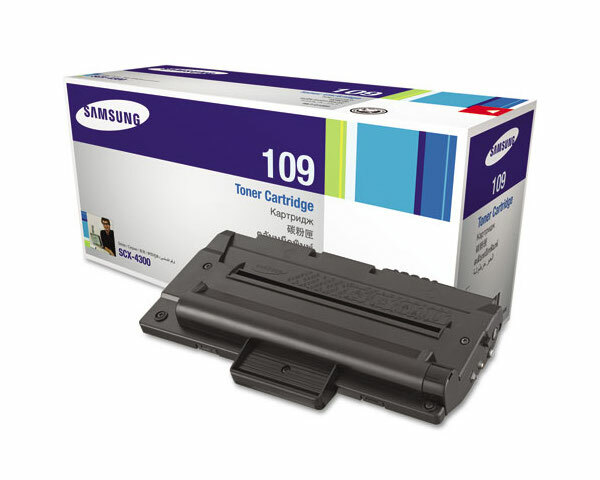 The Samsung SCX-4300 features a print speed of 19 pages per minute, which is a respectable rate for multifunction devices in this class. Print resolution up to 600 x 600 dots per inch provides reasonable quality text document reproduction. This device comes standard with 8 MB of printer RAM, allowing more consistent print speeds at maximum resolution without printer “thinking” delays. First page out times are less than 11 seconds when in standby mode and less than 53 seconds from a cold, powered-down state, providing quick functions for people who need to copy and print on the fly. Operating system compatibility for the print module is diverse for this class of MFP, offering support for Windows XP (32 and 64 bit), Windows Vista (32 and 64 bit), Windows 2003 Server, various builds of Linux and Mac OS X. Color scanning is possible at a maximum optical resolution of 600 x 2,400 dots per inch and a maximum enhanced resolution of 4,800 x 4,800 dots per inch, providing quality digitization of both text documents and graphics. Halftone and grayscale scans can be completed in as little as 15 to 30 seconds for fast text document copying. 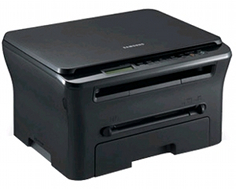 The Samsung SCX-4300 has a zoom range of 50 to 200% and a maximum multi-copy quantity of 99. Special copy functions include ID copy, auto-fit copy, clone copy and poster copy. N-up copy is also available, allowing the user to condense multiple documents onto one printed page to save toner and paper. This unit has a paper input tray that can hold 250 sheets and a multipurpose bypass tray that can feed one sheet at a time. Output capacity is 50 sheets of 20 pound weight plain paper. Supported media types that can be fed into the manual bypass are plain paper, transparencies, label sheets, card stock, envelopes, thick bond media, color photo paper and pre-printed paper. A monthly duty cycle of 10,000 sheets ensures fairly consistent operation that is sufficient for home office and small office, single-user needs. Print and copy speeds, although average for multifunction units such as this, are on the slow side for units that just offer printing capabilities. The maximum print resolution of 600 x 600 dots per inch, although acceptable for this class of devices, is half that of other laser printers designed for small business and home office use. 256 levels of grayscale, in addition to the limited print resolution, make this unit impractical for production of anything besides text documents. Graphics can come out grainy and pixelated. Full color scans can take up to 75 seconds to complete, which can take twice as long as other units with scanning capabilities. Only three levels of darkness control can make it hard to adjust for faded or light original documents and can potentially cause a user to over-darken, resulting in waste of toner and paper. The main input tray only holds plain paper with an average 20 pound weight and does not accommodate envelopes or other types of media. Envelope printing and duplexing can only be done manually, increasing the amount of time it takes to perform these functions and increasing the likelihood of operator error, resulting in possible waste of toner and paper, as well as registration shifts. The only interface available is high speed USB 2.0. No networking capabilities are possible unless the device is shared through the Windows OS that it is directly connected to. 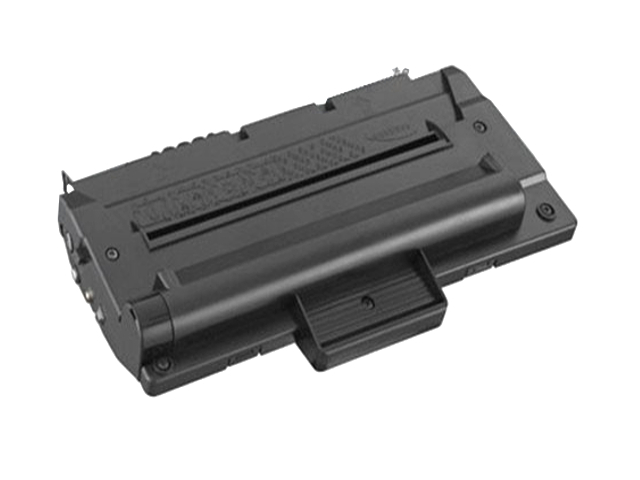 Review it: "Samsung SCX-4300 "
The Samsung SCX-4300 ships with a starter toner cartridge that has an average yield of 1,000 pages. One type of replacement cartridge is available that has an average yield of 2,000 pages. The average cost of toner is approximately 3 cents per page.